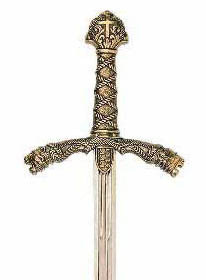 We have Replica Medieval swords, daggers and knives, replica Roman swords, Roman daggers, Excalibur sword, King Arthur sword, Richard the Lion Heart sword, Claymore sword, Scimitar, Shields, Knights Sword, Ceremonial Sword, Julius Caesar sword, Collectible Medieval swords, Replica Samurai Swords. This classic 19th century cavalry saber is a great prop, display or collectible. It was a favorite of the feared Russian Cossacks for decades. This sleek and ornate replica features antiqued brass engraved furniture, simulated ivory handle and 35" blade. Features, Overall Length:35". Blade:30"
See details Richard the Lion Heart's Sword.